Should have the prime shot and 4 cpuid screen open (CPU tab, Mainboard tab, Memory tab, spd tab) and the validation for the cpuid. I'm pretty noob when it comes to OC'ing, but had a good dialog with wisecracker here on the forum that has helped me alot. I runned prime95 7 hours over night on 14x280 = 3920MHz on Core Voltage 1.428V with no errors. Max temp 45C. I will also try to run 14x286 just to reach the golden limit of 4000Mhz Hopefully it works. Btw. It is an Athlon II x3 445 not unlocked cause bad 4'th core i believe. I still a bit new to over clocking and I still have the stock HSF so I am some what limited in what I can do but this is what I have so far. 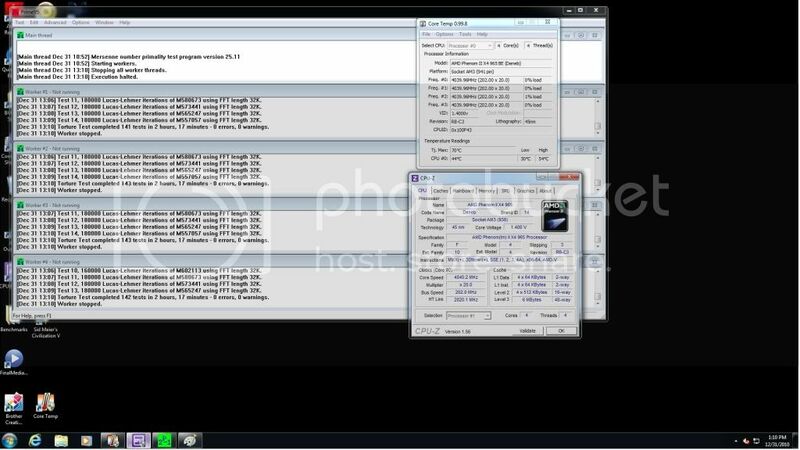 @oparadoxical_: The screen shot must show the total time that you ran prime95. Yeah I know, but read the above threads, I need the screen short, rules are rules. Ok, I looked at other peoples pictures of the prime95 test I see what you are saying; I hadn't stopped the prime test when I got the screen shot so I didn't have that total time on mine. Wouldn't the thing that says when it started and at what it was currently at be the same as if I stopped it though? Or is it slightly different how the Prime95 testing cycles work? I understand rules are rules so I am fine with redoing it, I just assumed that when the main threads started and stopped (or where they were currently at) would be adequate. I will do it again in the next couple days with a higher overclock and post it with all the necessary info. When you stop the test, at the end prime95 shows you the total time that you ran the test, or you can use LinX, with this you select the total time that you want run the test and this stop automatically when the total time is completed. TY green300!! Hehe yeah a little typo Corrected now!! But guys, I was wondering if my cpu is maybe bottlenecking my gpu?! Is there any improvements I could do to this oc? You will generally reach a point where additional clock speed will reduce latency BUT bandwidth will start to drop. Where can I see the latency and bandwith with SiSoft Sandra? @matta85: You can use AIDA 64 or Everest to check the latency and bandwith. You will be added soon. About the bottlenecking question in an earlier post.. Anyone? Will my Athlon II X3 445 @ 3,920GHz bottleneck my XFX HD 6870 @ 950/1110?? NB Frequency: 2467MHz set in BIOS (*10) | 2713MHz in CPU-Z (*11)??? For some reason my CPU-Z validation shows as rejected and can't figure that one out, but there's the link anyway.....maybe it has something to do with the NB Frequency showing up incorrectly? Rejections happen a lot, try closing just browser window and clicking the "submit" button again, will usually except it on the second or third try. Thanks, just tried it again and it validated.